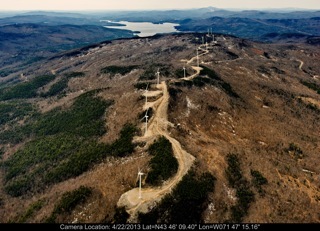 ALEXANDRIA — The Spain-based wind-power company that drew public outcry with its proposed wind farm project for the ridgelines near Newfound Lake and Mount Cardigan has not filed for permits for the project with the state. Last fall, Iberdrola Renewables approached the towns of Alexandria, Grafton and Danbury in October to lay out its plans for the Wild Meadows Wind Power Project, a 74-megawatt, 37-tower array of towers on a 6,000-acre parcel the company has leased from landowners in Alexandria, Danbury and Grafton. In meetings with residents, Iberdrola officials said the company, which received the state’s Site Evaluation Committee approval for its 48-megawatt wind farm project in Groton last year, would be filing for state permits during the winter months, according to town officials. But the evaluation committee hasn’t seen an application yet, said Timothy W. Drew, administrator of the Public Information and Permitting Unit at the state Department of Environmental Services. “We’ve been reading a lot about Wild Meadows in the paper, but we haven’t seen anything (from Iberdrola) yet,” Drew said. Iberdrola’s Ed Cherian said the project planning is taking time. The president of the primary organization opposing the Wild Meadows project, New Hampshire Wind Watch, said she was surprised, but pleased, at the apparent delay in the Wild Meadows filing. Wind Watch members question whether the project would benefit New Hampshire’s renewable energy needs, and say any financial benefits offered to the three towns would be outweighed by the negative effects of the towers. Of the 37 towers, 30 would be erected along the top of a picturesque mountain ridge behind Newfound Lake, producing an ugly sight to boaters and lake residents that could cost the towns tourism dollars, members said. Iberdrola said the project would bring jobs to the towns, and the company has told the three towns the project would bring huge benefits in terms of reducing tax rates, as it has done in Groton. Groton selectmen signed a 15-year agreement with the company that will pay the town $528,000 — roughly equivalent to Groton’s most recent town budget — in the first year, and each of the project’s 24 wind turbines will net the town $22,000 in the years that follow. Tags: Wild Meadows Wind. Bookmark the permalink.